English Crash Course for Cruise Line – 100% Success Rate! If you’re thinking about working in a cruise line but can’t meet all qualifications because of your English language ability, then come to us and we’re ready to help you. Our language program ‘English Crash-Course’ is designed specifically to assist you learn English in a quick, effective and easy way. We will show you strategies to improve your communication especially conversation skills to pass your interview, teach you more about customer service, develop your personality and prepare you to work abroad. Come and take the pre-assessment to know your English level. It is a 18-36 Hours session/program usually taken between 1-3 months period with flexible time schedule, morning or afternoon session available. Please call us to reserve a seat, or ask for more information. Avail of promos and big discounts for group class. English for All Learners – Make it happen! English Buzz has continued to serve a lot of students from all age levels using an international curriculum with holistic methods of teaching. 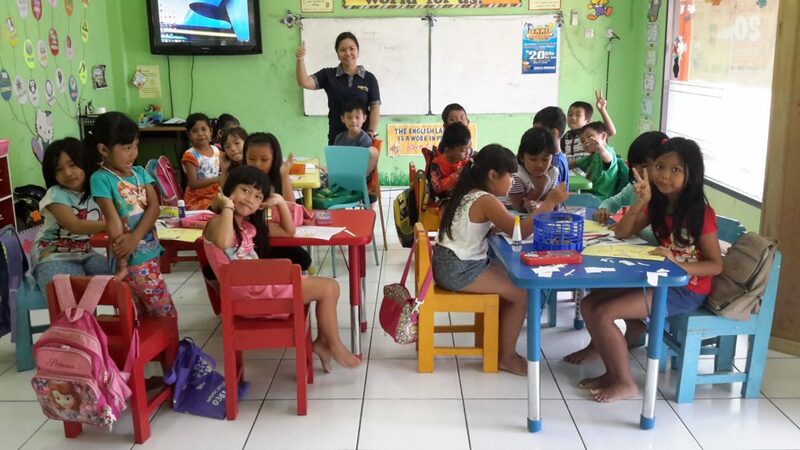 Bahasa Indonesia class is taught by professional and well-trained instructors. The English program caters to the needs of young adults to prepare themselves for work (hotel, airline and cruiseline) here or abroad and to bring out the potential for each one of them, enhancing their speaking and listening skills. We offer payment schemes to help deserving students achieve their dreams. Call us for more information. 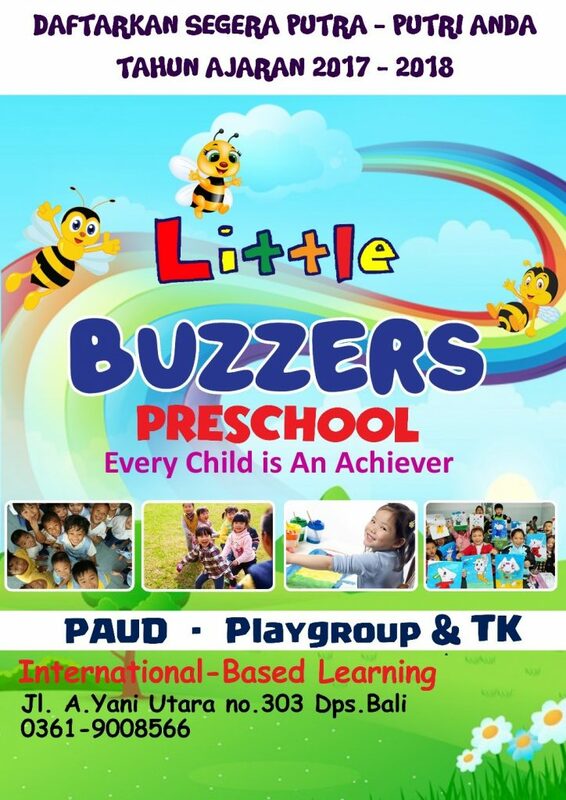 English Buzz Language School, has given birth to a new baby called Little Buzzers Preschool. Its program for language instruction is in English and has a curriculum designed specifically for the language needs of children ages 3-6 years old (PAUD-Playgroup and TK). For more information please visit its own website at www.littlebuzzers-preschoool.org. 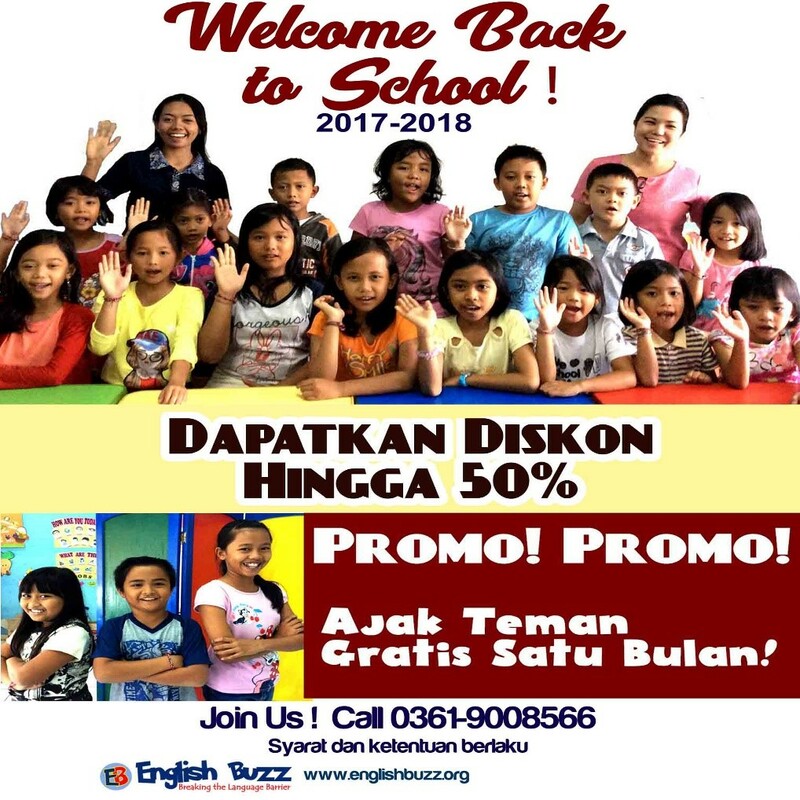 English Buzz welcomes all students for this school year 2017-2018 with a bang! We are giving away 50% off (Registration Fee) to the next child enrolling. Also, our promo for this month ‘Ajak Teman-Gratis Satu Bulan’ (invite a friend-get one month free lessons) is also back. All you have to do is call or visit us to learn more about this promotions. Summer Program – Make your holiday worthwhile. Learn a new language and meet new friends! Starts June 5 to July 6. Learn English this holiday. Open for children ages 6-12 years of age. Hear ye, hear ye! It’s back! A Crash Course in English for hospitality & service industry is now open! service industry is now open! Learn English fast and easy- Classes are now open for those students who wish to work at any hospitality or service industry such as cruise line, airline, hotels and restaurants among others. Program is available for a month, two-month course and three-month course depending on their progress and skills achieved. Our school offers low tuition fees and light payment schemes for our students. 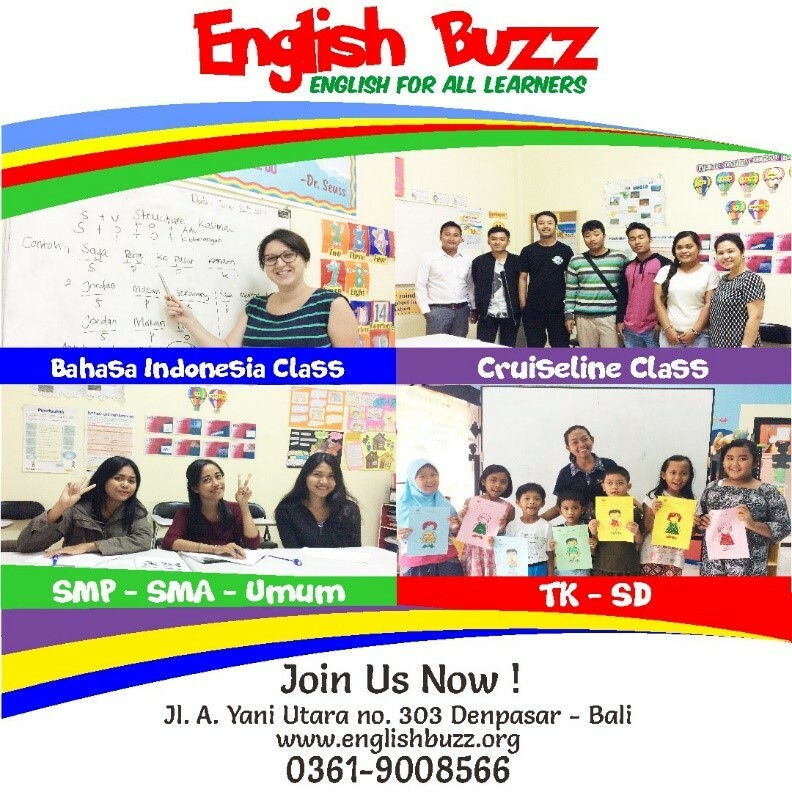 Invitation for a JOINT VENTURE - English Buzz Bali also invites investors, owners and managers of any hospitality and service industry for a joint venture, that is specialized English course in a group package. Our school offers langage services to your team or staff, customers, students or applicants, among others, to carry their jobs (local and global) effectively and successfully. Increase your company’s sales and revenue by joining our family. Pls.follow this link to see our proposal letter. We believe that great things start from small beginnings! 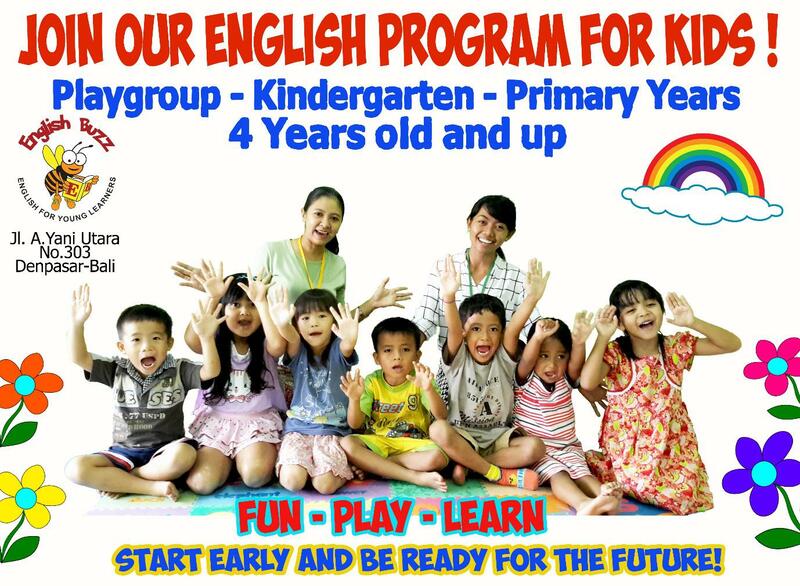 Our school is now ready to teach English language for our learners ages 4 years old and up to primary level. This program is designed to teach them the basic skills just right for their age level. It’s purely fun and interesting activities for your young learners. Start now and bring out the best in your children.